"Sampath Speaking" - the thoughts of an Insurer from Thiruvallikkeni: 770 seconds of glory ~ Indian seven metre (23-foot) scale model space shuttle makes maiden return ! 770 seconds of glory ~ Indian seven metre (23-foot) scale model space shuttle makes maiden return ! The entire flight lasted just 770 seconds, yet, Monday, 23rd May 2016 is certainly a day to remember for on this day, the Indian Space Research Organisation (ISRO) embarked on a first-of-its-kind test — hoisting into space what is essentially a scale model of what would be India’s indigenously designed space shuttle. 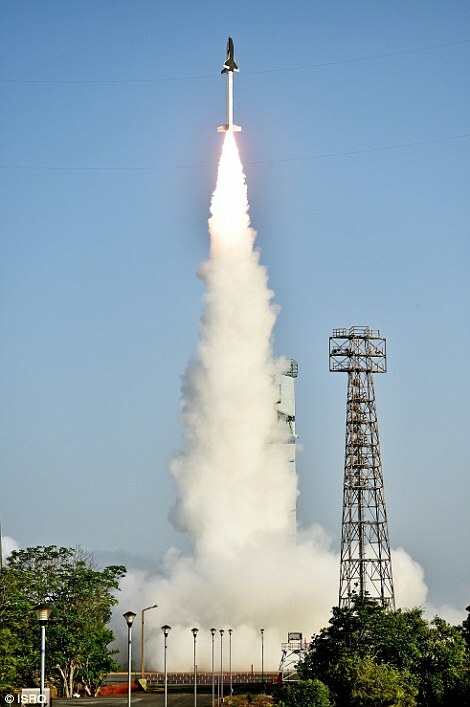 The 6.5m-long Re-usable Launch Vehicle–Technology Demonstrator (RLV-TD) weighs about 1.75 tonnes and is the result of more than a decade of development costing around Rs 95 crore. The space research activities were initiated in our country during the early 1960’s, when applications using satellites were in experimental stages even in the United States. With the live transmission of Tokyo Olympic Games across the Pacific by the American Satellite ‘Syncom-3’ demonstrating the power of communication satellites, Dr. Vikram Sarabhai, the founding father of Indian space programme, quickly recognized the benefits of space technologies for India. ISRO (Indian Space Research Organisation) vision is to "harness space technology for national development, while pursuing space science research and planetary exploration". Formed in 1969, ISRO superseded the erstwhile Indian National Committee for Space Research (INCOSPAR) established in 1962. ISRO built India's first satellite, ‘Aryabhata’ which was launched by the Soviet Union on 19 April in 1975. In 1980, Rohini became the first satellite to be placed in orbit by an Indian-made launch vehicle, SLV-3. ISRO subsequently developed two other rockets: the Polar Satellite Launch Vehicle (PSLV) for launching satellites into polar orbits and the Geosynchronous Satellite Launch Vehicle (GSLV) for placing satellites into geostationary orbits. These rockets have launched numerous communications satellites and earth observation satellites. ISRO sent lunar orbiter, Chandrayaan-1, in Oct 2008 and Mars orbiter, in Sept 2014, making India the first nation to succeed on its first attempt. It has been almost five years since Nasa sent its Space Shuttle on its final flight into orbit, but a new generation of reusable spacecraft are preparing the ground for a new race into the heavens. Counties including Japan and Russia have joined private companies like Blue Origin and SpaceX in building reusable space rockets, and now India is the latest country to step up to the challenge. 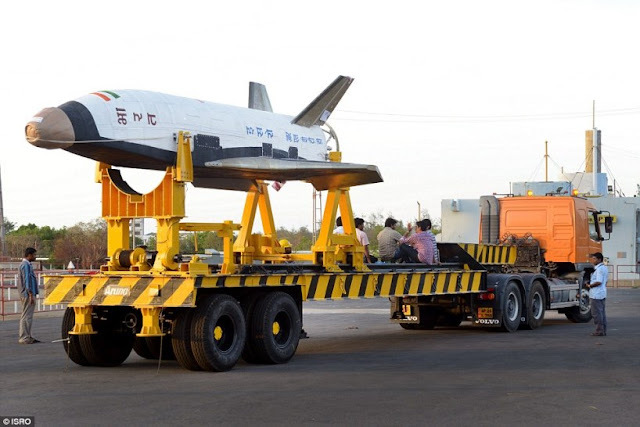 In what is a proud moment for India, seven metre (23-foot) scale model space shuttle blasted off from a southeastern space port, in a crucial step to eventually developing a full-scale, reusable one to send up satellites in the future. The success of India’s first winged body aerospace vehicle operating in hypersonic flight regime brings fame. In this experimental mission, the HS9 solid rocket booster carrying RLV-TD lifted off from the First Launch Pad at Satish Dhawan Space Centre, Sriharikota at 07:00hr IST. After a successful flight of 91.1second, HS9 burn out occurred, following which both HS9 and RLV-TD mounted on its top coasted to a height of about 56 km. At that height, RLV-TD separated from HS9 booster and further ascended to a height of about 65km. From that peak altitude of 65 km, RLV-TD began its descent followed by atmospheric re-entry at around Mach 5 (five times the speed of sound). The vehicle’s Navigation, Guidance and Control system accurately steered the vehicle during this phase for safe descent. After successfully surviving a high temperatures of re-entry with the help of its Thermal Protection System (TPS), RLV-TD successfully glided down to the defined landing spot over Bay of Bengal, at a distance of about 450km from Sriharikota, thereby fulfilling its mission objectives. The vehicle was successfully tracked during its flight from ground stations at Sriharikota and a shipborne terminal. Total flight duration from launch to landing of this mission of the delta winged RLV-TD, lasted for about 770seconds. ISRO acknowledge the support of Indian coast guard and National Institute of Ocean technology (NIOT) for the mid sea wind measurement and shipborne telemetry respectively in this mission. The move marks a crucial step towards developing a full-scale resuable model to launch satellites in the future and highlights India's presence as a serious space faring nation. Indian scientists hope that subsequent larger version, expected to be six times the size, will be launched over the next decade and will make it safely back to Earth. India faces stiff competition including from global companies which are developing their own reusable rockets after Nasa retired its space shuttle programme in 2011. Reusable rockets would cut costs and waste in the space industry, which currently loses millions of dollars in jettisoned machinery after each launch. Billionaire Elon Musk's SpaceX and Amazon owner Jeff Bezos's Blue Origin have already successfully undertaken their own test launches. Russia, Japan and the European Space Agency are also developing similar technology and are in testing stages. SpaceX has managed to land three rockets from space back on Earth - two on sea and one on land, while Blue Origin's New Shepard successfully completed a third launch and vertical landing in April this year. Even as India basks in glory, some critics are trying to cast some blame stating that US spent an estimated $192 billion on the shuttle programme from 1971 to 2010. "The average cost per launch works out to $1.2 billion, which is as much as the total annual Indian space budget. It is a costly experiment that India can ill-afford."